Do yourself and your customers a big favor by giving them the keys to their own account information. Incorporating the TIMS Ecommerce module not only lets your customers buy their gases and hardgoods from you on their own time, 24/7, it gives them the ability to manage their own account and its users. All the previous downtime spent looking up customer information that once over-burdened your staff, can now be accomplished by your customer, safely and securely. They’ll have the power to pay their invoice online, and you’ll use a lot less stamps. Just wanted to drop you a quick note on the Computers Unlimited integration for Simcoe Compressed Gas, after one month of utilization. While admittedly there were some bumps and hurdles, your team has handled all of our questions and concerns with grace and efficiency. I have nothing but good things to say about your team, response time, and handling of our (ok, mostly my) sometimes repetitive inquires. Our team here at Simcoe, especially the new users that have experience with other systems including SAP and ERP, have commented several time show easy and user-friendly it is. We appreciate all of your help and support, if you need a reference for anyone interested in using the cloud version of your software please do not hesitate to ask! Thanks again for all your help and support! ACM Cylinder Count Testimonial The time savings, the accuracy, and the ease of the process, were the three highlights of using the new Cylinder Count app We inventoried our cylinders company-wide once per year. We used to have people writing on paper and we would tally, and you had to find the right page with the part number that you were counting. It was very time intensive and very low accuracy. We counted one pile of 66 cylinders in about 3 minutes. We intend to do the equivalent of cycle counts, to reset our inventory balances. The thought is we should do the same with steel and gases as our hard-goods. We were very happy with the end result of the count. This was our first attempt, and I estimate in the future it will take maybe 1/10th the time as it used to. TIMS eCommerce is an excellent online ordering tool and a great resource for customers. For me as an IT manager, working with Computers Unlimited (CU) has come to mean a rock solid alliance for my business. It is a company I have entrusted to support my company. My relationship with CU is critical to keeping my business healthy. It is a company I believe in and depend upon on a regular basis. However, for me personally, it means more than just these things. Brian C. has been a HUGE help to us for this wireless project. He has really dedicated a lot of time to it and I really appreciate it. David [in Technical Support] was our focal point of contact with regard to technical issues [during the system recovery process]. He did a great job with our system recovery and was a pleasure to work with. When I think back on my eighteen year association with Computers Unlimited, two words come to the forefront; partnership and attentiveness. From my very first TIMS roll out with project management, CU’s corporate culture of caring was evident in both their efforts to ensure the successful implementation of the software and their willingness to listen to (and act on) suggestions to improve and make it more user friendly. CU knows their “users” are more than customers; they consider them partners in growing their mutual businesses. Derek in Application Support is absolutely the best. I cannot think of one time – for any issue – that Derek has not given 100% effort. Chris in Application Support was also amazing, he never gave up until a problem was resolved. Penn Oxygen & Supply Co. Thank you, Lin G. and Dave S., for your hard work on getting this job done. David, you did a super job of heading this project up and covering all the bases. It is such a blessing to have great resource people to call on when you need help…that is why my loyalty is to Computers Unlimited, you guys have never let me down. Computers Unlimited’s TIMS system has assisted us in becoming a 21st century technology company within a century old industry. Their system creates information at our fingertips with technology from thought to finish. It’s so much more than just a price update system… It’s easy to price and quote non-stock items without any rekeying. There’s no better system out there. We switched to ACM from a web based tracking system because ACM is fully integrated. We were tired of managing two separate systems and dealing with manual entry. We’ve realized incredible savings with ACM. Our oldest employee liked TIMS immediately. He didn’t struggle through a learning curve at all. It was wonderful! Since using ACM, we reduced our cylinder exception errors by 86%, and significantly improved our driver’s route efficiency. TIMS catalog system gives us a virtual SKU inventory without all the additional overhead. Imaging saves us a ton of time! Without it, we’d have to hire an additional employee for managing MSDS paperwork. All of our branches are self-sufficient for looking up images. The Encompass Gas Group, Inc. Customer Centric is great, you have all of your customer information you need in one place. Plus, the History tab in CCI is a huge timesaver. Using TIMS standard Inventory Management and Automated Purchasing, we were able to reduce inventory levels by over $330,000 in just 40 days. In today’s economy, everyone is looking to do more with less. TIMS eDocs allows you to make current resources even more efficient, so existing staff can focus on other important business tasks. Kenny was able to help me with my stress of this crazy file! PS..he is AWESOME!! Has anyone told you guys lately that y’all are awesome!!!! If not, then let me be the first…..YOU GUYS ARE AWESOME!!!. Thank you for the hard work and the time you are spending and for the help you are giving me. The images below look great! Thank you both again! We now have users putting in hundreds of orders per month with TIMS Assistant. It's extremely handy to have all of your customer's information including contracts, open orders, history etc. at your fingertips. Many of our guys use it to scan the customers inventory items when they are placing the order in the field. All of this has increased efficiency and accuracy. It's sometimes hard to imagine not having TIMS Assistant now! It's a fully functional mobile version of TIMS Software. Our sales staff is using TIMS Assistant to enter orders, check inventory availability, and address cylinder balance questions in real-time. They like the fact that they have the ability to address many sales history questions and how deep you can drill down in certain areas to resolve issues. It helps the sales team to be functional and responsive while in the field. With TIMS Assistant I have access to all the standard TIMS information out in the field so I can get my orders in on-time. TIMS Assistant has helped me with real-time cylinder inventory which has led to avoiding disputes. It’s a great time saver. I can get real-time answers to questions that I would normally have had to rely on someone else for the answer. For salespeople, it is the best tool we have had so far. Just about everything I need is at my fingertips. I’m not depending on others as much so it saves the whole company time and I have the peace of mind knowing that what I need is correct. Our staff uses TIMS Assistant when writing up orders away from the office or when making a delivery with ACM tracked cylinders. TIMS Assistant improves our efficiency as orders are written up in real-time, dispatched quickly and seamlessly, and as all cylinder barcodes are attached using the scan feature. The system also allows our sales staff to review account information in the field if a customer has questions on pricing, gas use, or wants a quote written up immediately. TIMS Assistant has been a great asset for Sutton-Garten Company. What if you had a better way to utilize staff more efficiently ... and help you realize more revenue? 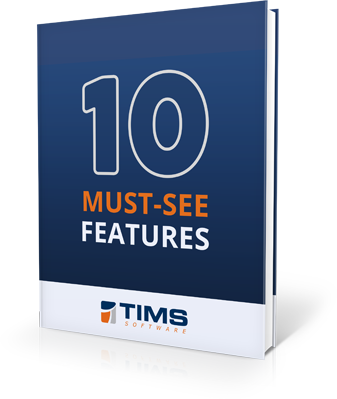 Think of TIMS as the game-changer that puts you ahead of your competition with these capabilities and more all from one software.